The first English Pinot Meunier rosé wine? Exton Park’s first 100% Pinot Meunier Rosé is being launched at the London Wine Fair this week, from the English Wine Producers’ stand T34. This is a new departure for Exton Park and winemaker Corinne Seely. The wine, made entirely from the 2014 vintage – but not named as such – is an exclusive blend of the older Pinot Meunier plots in the 55 acre vineyard, planted in 2003 and onwards. In the new state-of-the-art winery each plot was vinified and kept separately to provide a wide-ranging palette when Seely created the final cuvee from this excep tional year. It was then bottled in green glass, not only to differentiate between the current, award-winning Rose NV, but also to preserve the colour and quality of the sensitive Meunier grape. And after 12 months on the lees, was disgorged earlier this year – ready for its first appearance in May. 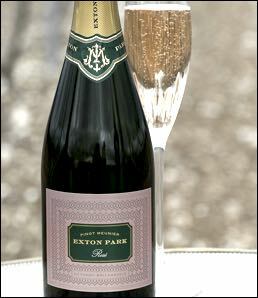 The Exton Park Pinot Meunier Rose shows true Meunier grape characteristics, and is believed to be the only sparkling wine of its kind to be made in England. 10. Find out the latest news about English wine week - set to be the busiest ever in 2016, taking place at the end of May.